Down South of the Border. Donghae Port, South Korea. 6th December 2014. The ferry crossing was rough. Tatiana had told me it nearly didn’t sail due to rough seas and the motion of the boat did nothing in the slightest to suggest she was exaggerating. I’m lucky in that I don’t suffer from seasickness but even so, I didn’t eat much that evening and I was was happy to have an early night and ride it out in a horizontal position. Calm had descended by the time we reached the port at Donghae and the crew got me off the boat first so I could get through immigration quickly. The ferry was late and they wanted me to get my bike out of the hold as quickly as possible. 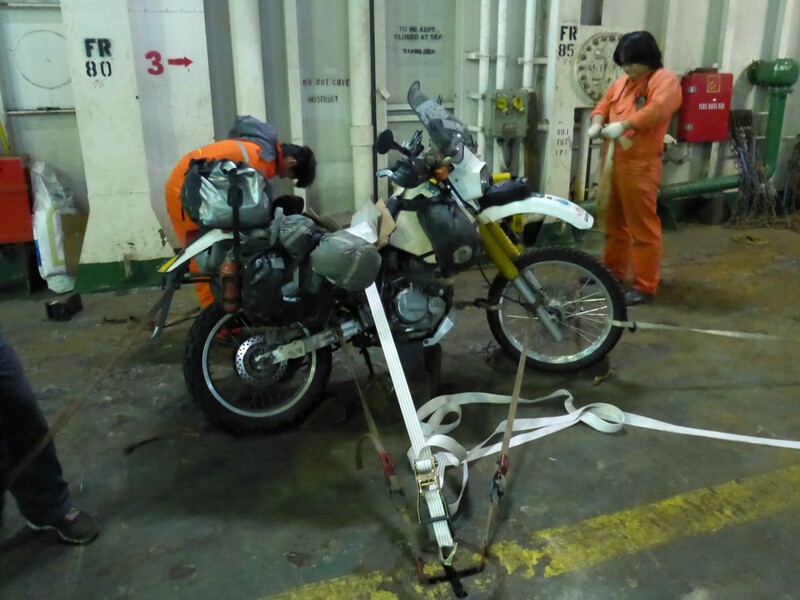 Once on dry land the ferry agents got customs round and they checked the VIN on the bike, asked me what was in my panniers and that was that. Back in the office I paid the agents the customs security and (horrendous) road insurance fees and all was done. I was free to start my journey to Seoul, remembering to drive on the right. Luckily I commented to the agents that I was planning to take the Expressway and hoped the tolls weren’t too high. They didn’t quite show me the universal crossed arms sign of ‘Oh no you can’t,’ but they were quick to tell me that motorcycles weren’t allowed on Expressways in Korea. I was flabbergasted although they didn’t know the reason why. So I set my GPS for ‘shortest distance’ and headed for the hills. I had no paper maps for Korea. In my innocence I was just going to rely on the GPS and follow the signs, so hadn’t felt the need to get any. Now I was totally reliant on the GPS to get me there as I’d be on local roads with local signs. A very well strapped down bike survived the rough crossing. At first I was riding main roads with single digit numbers. But as time went by, and I climbed further into the mountains, the GPS took me on a series of smaller roads with higher numbers, a sure sign of back roads discovery. And climb we did, well over 1,200 metres at times. It had been snowing in the last few days but the roads themselves were clear and also bone dry. So I enjoyed myself on the well surfaced roads, often with two lanes on the up slopes enabling me to tackle the bends with enthusiasm. Ultimately much more fun than a boring dual carriageway and obviously far cheaper. But it was freezing cold! I was wearing every bit of warm biking clothing I had and was just about managing to feel OK. At one point I rode though a village which had several snowboard supply shops along the street. Off to my left was a snowy slope with snowboarders having fun. A guy who was walking back from there stood with mouth agape as I rode past him, obviously unable to comprehend this alien activity taking place in front of his eyes. I just shivered, smiled at him and rode on. Around lunchtime I happened upon a wooden building with ‘Cafe’ written on the side. I didn’t need any second bidding and pulled up, the ice on my riding gear crackling as I dismounted. OK, that last bit was an exaggeration but it felt cold enough for that to happen. The woman inside was asleep on her settee when I came through the door but soon enough organised a big mug of deep, black Joe, as Agent Coper would have said. There was no milk available. I declined her offer of food and she was kind enough to allow me to eat the sandwiches I’d bought for the boat journey. A second mug of coffee had me set up for the second stage of the journey. We talked a lot but neither of us understood a word the other said. When I paid I’m pretty sure she charged me less than the price on the menu. How kind of her. I reached Seoul before dark and came across a fair bit of traffic. 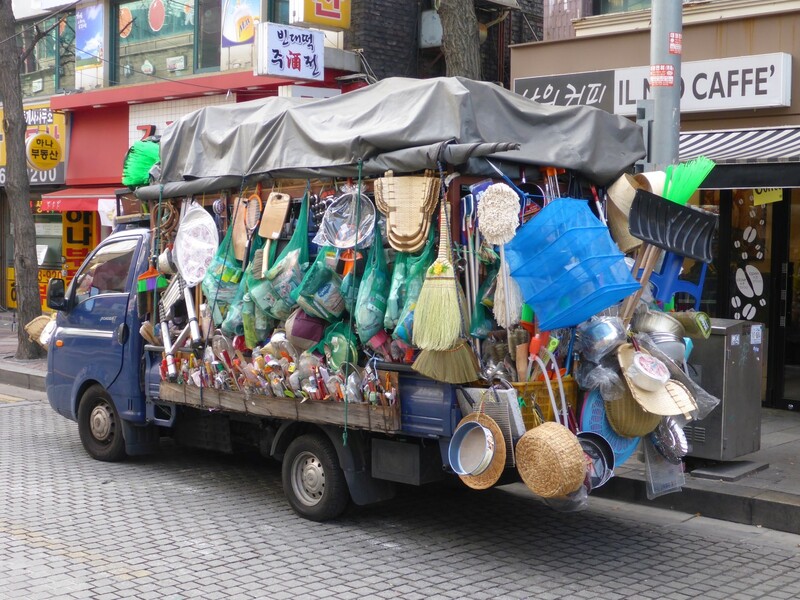 Korean drivers are far more assertive than their Japanese counterparts, I’m pleased to say. In Seoul they’re more like Russians at times. They’re happy to mix it, so as to make progress. The speed limits are higher too; 60kph in town and 80kph elsewhere. It didn’t take me too long to get to the hostel I’d booked. It was refreshingly easy to find the street. 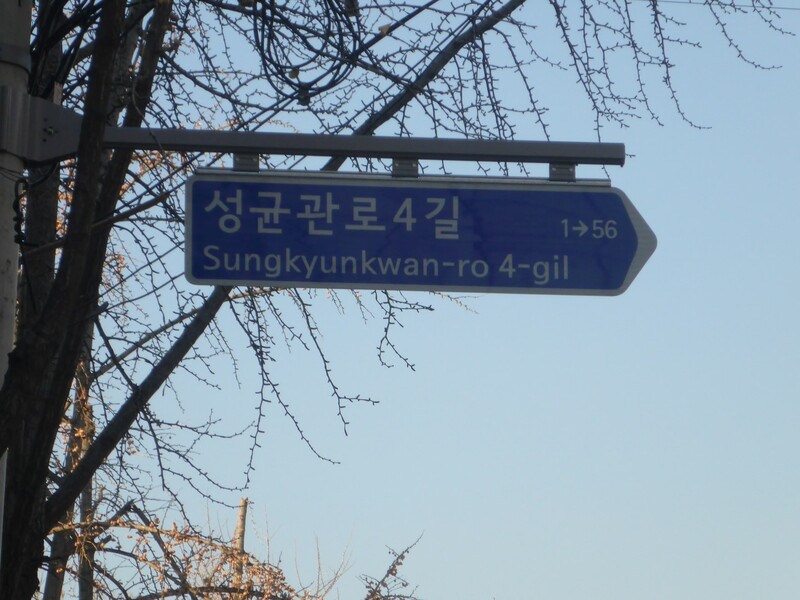 Korea has recently changed its street naming system and it works. The signs are in English too, and the supplementary number told me how many turnings along the street would be the small turning I needed. The address of the hostel reflected this. Horizons Unlimited led me to contact Seoul Joe who is the ‘go to guy’ in Korea for travelling bikers. He rides a Harley and has undertaken several journeys on it across Russia and around Europe. He usually sends people to this hostel and it was a good choice. It’s close to a university so there are plenty of small shops and cheap places to eat. The friendly, English speaking couple who own it put me in a room by myself although it was tiny and windowless. Still, it was going to be nice to have my own personal space for the next week. I was soon settled in and breakfast was included in the price. The hostel owners had found me a parking place outside a friend’s house where they felt the bike would be safe, so I could relax. Meaningful street signs. Japan, please take note! I’ve often met interesting people in hostels. Here I met a Dutch guy, Larry, who’s around my age. He went on a visit to Iceland when he was young and when he learnt that work in the fishing industry there would get him ten times what he was earning in Holland, he didn’t bother going home. Who could blame him? He’s worked all over the world but now he’s in Alaska and because they shut down for five months of the year he goes travelling. Meanwhile his Brazilian girlfriend goes home to see her family. They have a house in Portugal too, ready for retirement. We had some enjoyable chats, as well as with some of the other guests. My next key task was to organise the transportation of Doris from Korea to Auckland. While I was still in Japan I had already contacted Wendy Choi, from Aero International, to get the ball rolling. 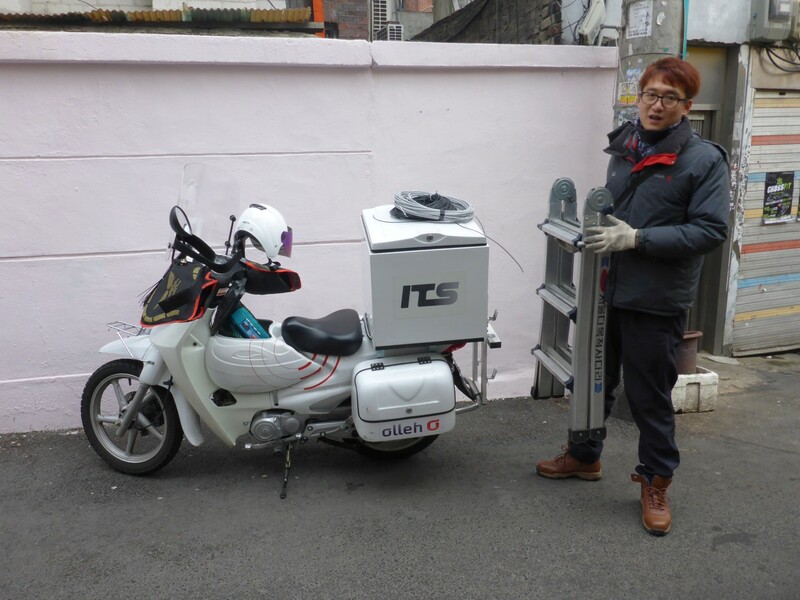 If Seoul Joe is the ‘go to guy’ for advice and information then Wendy is the ‘go to girl’ for bike transportation. Her details also came from Horizons Unlimited. She already knew what I wanted and when by, all I needed to do was finalise arrangements. I was a bit nervous about it all as it was a major step into an area of organisation where I’d never been before. The big question for a task like this has to be sea or air? Sea is cheaper but will take far longer and you have little control over the date of arrival. Especially on such a journey as this one where a ship would visit many different ports en route and suffer delays and possible diversions. 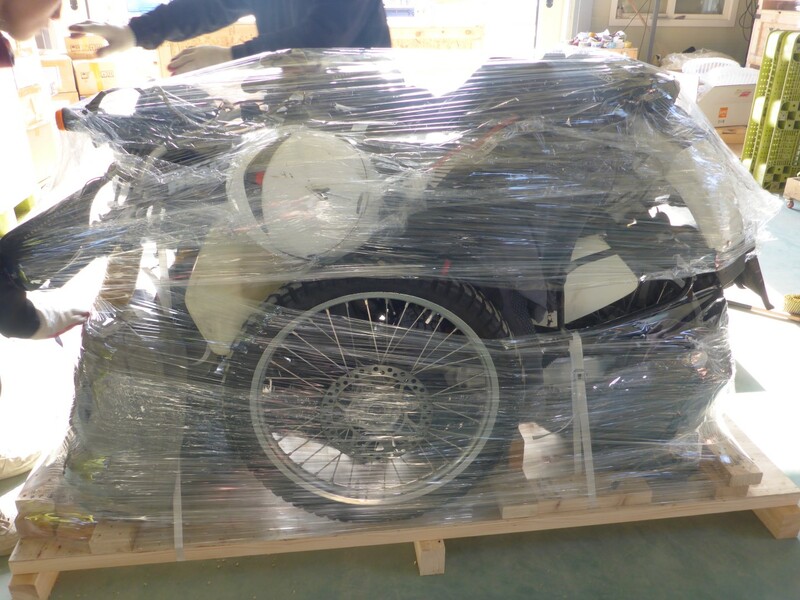 Air freight is dearer but you know when the bike will leave and when it will arrive as it’s booked onto a scheduled flight, albeit one just for freight. A simple choice. I wanted my bike to arrive in New Zealand at the same time as I did. After all, I had some summer sunshine to ride in and that just wouldn’t wait! By now it was Tuesday and two things happened. I made contact with Joe and he said he’d pick me up at the hostel and take me to lunch. Great! Then I made contact with Wendy and she said she’d meet me that evening and we’d go for something to eat while we discussed business. That sounded good too. Seen on the street near the hostel. Anything you could ever need. Joe picked me up in his Porche Carrera and we went to a restaurant where he’s clearly well known. He’s a couple of years older than me and is a former financier. He’s retired now but has been supervising the building of a new house and is about to move in. On the way there we went to a couple of car wash places to see if they could clean my bike. This was an important job as New Zealand is very hot on imported vehicles being very clean. As an island they sensibly try to minimise risk from outside organisms being carried in. Doris was not clean a clean girl. The first place we tried didn’t want to do it as it was too cold. I’m not sure why that would have been a problem. The second place was more helpful and Joe arranged that I’d go down there next day for a steam clean. Lunch was delicious. We’d barely sat down before soup arrived at the table followed by some breaded fish, breaded pork and breaded chicken. It came with a very tasty sauce, rice and some salad. Nothing too challenging for the western palate. He ordered us a small bottle of Sake which he gave to me to finish off. My protests were ignored. I took the opportunity to ask Joe about why bikes can’t use the Expressways. It’s a typical tale of prejudice and overuse of power. The first Expressway opened in 1972. In 1976 a government minister was being driven along it when he saw a motorcyclist weave his way through the traffic and he decided that was too dangerous. Within a few months he’d persuaded the government to introduce the ban. Utterly stupid! Joe said there had been regular protests ever since, including blocking the Expressways, and some people had gone to prison because of it. But so far, no sign of change. So the prejudiced actions of one man have prevented bikes using the safest roads ever since. How stupid. Sensible use of two wheels on Seoul’s busy streets. We went back to the hostel and had a coffee in the cafe below. We talked about his trips and compared notes on Russia and other places where we’d both ridden. He was puzzled as to why I was in Korea so late in the year, thinking I’d come from Vladivostok. When I explained that I’d come from Japan, and some of the things that had delayed me, he understood. He doesn’t travel any more because of family but he organises trips for others. He often directs people to this hostel so I took him upstairs to meet the owners who were pleased to see him. I’m very grateful to Joe for his help and kindness – and the very nice lunch! 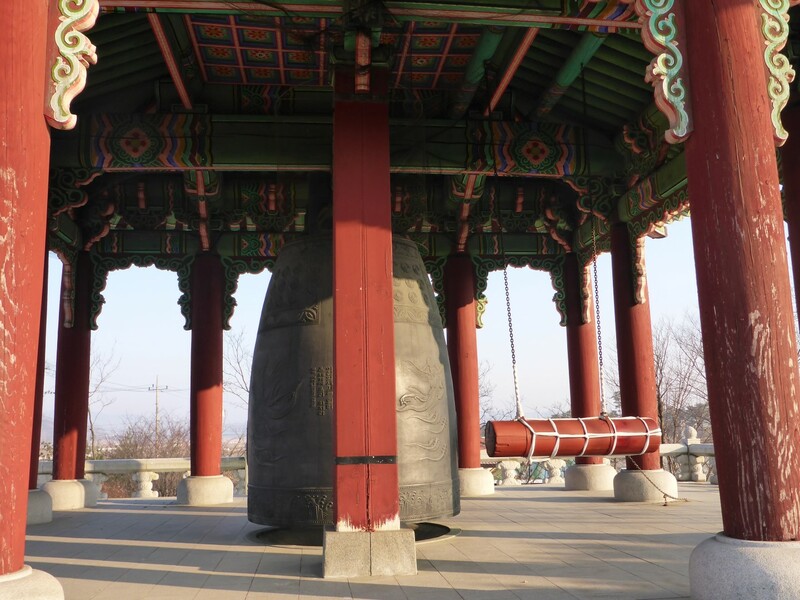 Although cold, it was a nice sunny day so I decided to walk down to visit a couple of the cultural sites that Seoul offers. Changgyeonggung Palace is the smaller of the two and was built in the 15th C but many of the buildings were replicas, the originals having been destroyed by fire. Others were damaged when the Japanese invaded and annexed Korea in 1910. That was something I’d never heard of before. 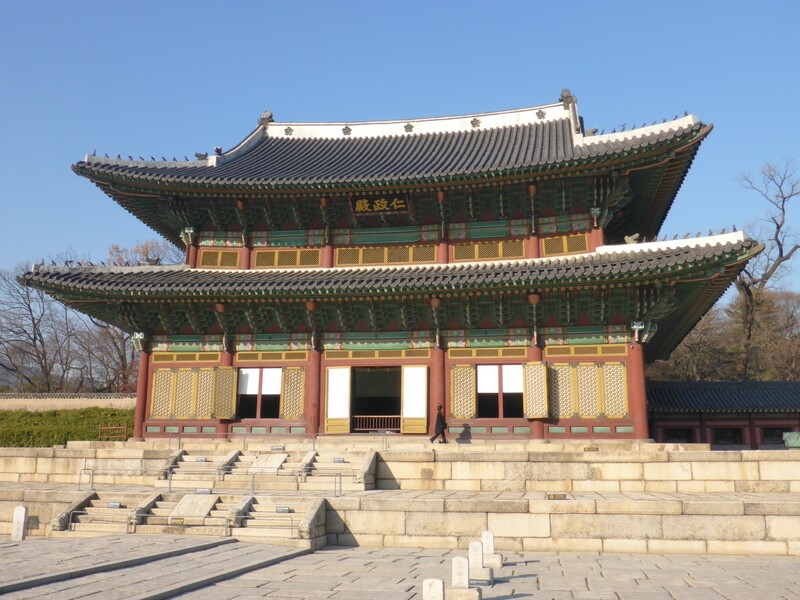 Part of the Changgeongung complex. 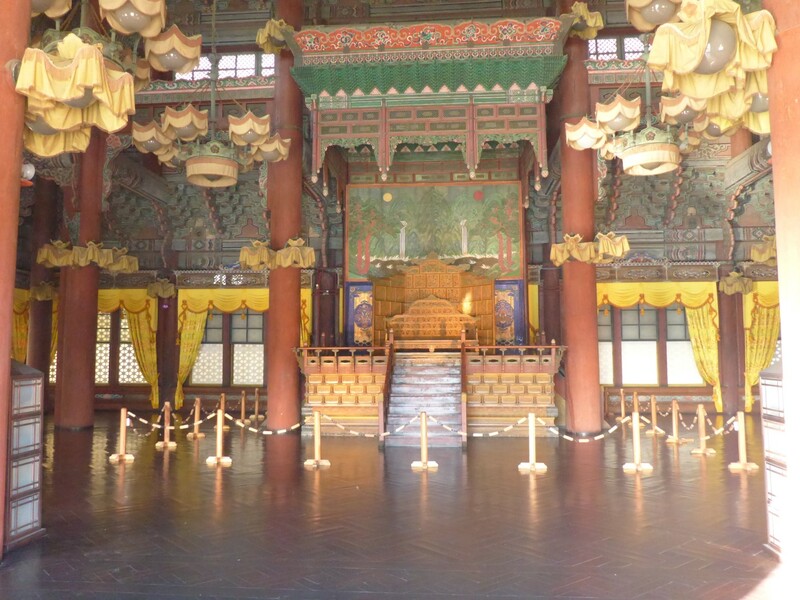 The bigger palace, Changeokgung, was were the King and Queen used to live. It had suffered a similar fate to the other one but many of the buildings had been moved there from other sites when the originals had been destroyed. Not original then but good enough to become a Unesco World Heritage site. The general design of the buildings looked similar to many of those I’d seen in Japan and I suppose they were typically Far Eastern in design and construction. But there were two differences. The detail decoration was different, reflecting the different cultures, but most noticeably was the complete lack of priestly paraphernalia that tends to surround (plague?) the Japanese temples. That was the reason I suppose. These weren’t active religious buildings but historical sites. Still, it made a pleasant change to enjoy the peace and quiet. The throne room in the palace. Back at the hostel I spent some time organising my gear ready for transportation. I cleaned my camping gear in case it got inspected, discovering in the process that my sleeping bag was wet. So that went in the wash, along with some other things. Laundry was free here, a refreshing change form some places that want to charge you for everything. Wendy arrived at 19.30, as promised, and we went off to eat. For the second time that day I was treated to a meal. Just as well really as I’d forgotten to bring my wallet out. Chinese style pork and noodles, eaten at one of the dozens of small eateries that fill the streets around the hostel. And just for once I was sitting in front of a woman who seemed to be impressed with my chopstick skills! Wendy explained everything about the shipping to me. It was quite simple really. She’d already booked the bike onto a flight with Cathay Pacific, due to arrive in Auckland next Tuesday. I was due to arrive the Sunday before, so that worked out well. Preparing the bike for the flight was going to be straightforward. She’d arranged to have it crated up by a company that she uses regularly. Someone from there was to meet me outside a hotel near the airport and I would follow them to their premises. 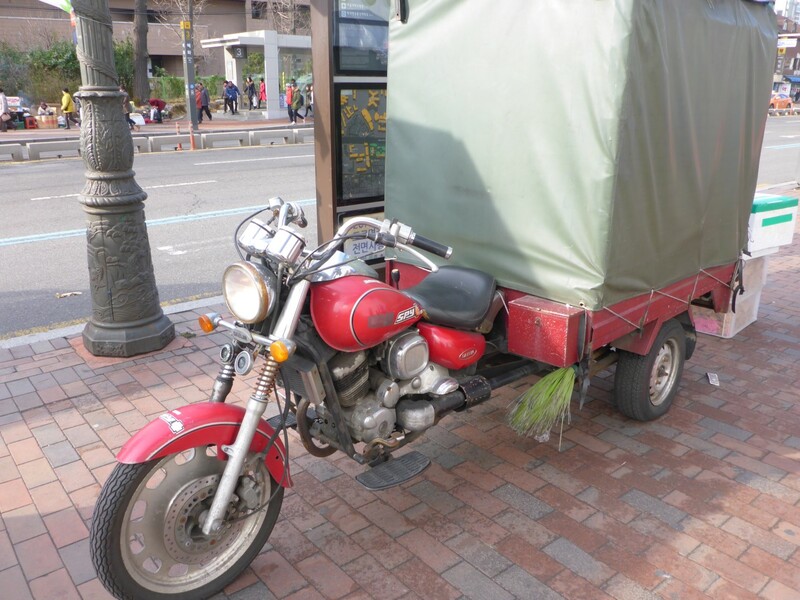 I would do whatever I could to get the bike as small as possible and they would deliver it to the warehouse once crated. Nice and straightforward. The cost would be unknown at that stage because it all depended on the size and weight of the crate. At this point it might have been tempting to worry about how that might work out but Wendy had a good reputation and she was clearly good at her job. I found nothing to fret about. She’d taken me to a coffee shop by now so we walked back to the hostel and agreed to meet Thursday evening by which time she’d have a final cost worked out. The only slight drawback was that I had to pay her either in cash or by bank transfer, no credit cards. There was no way for me to draw out enough cash so international bank transfer it would have to be. Wednesday was clean up day. I got some cleaning gear off the hostel owners, brought my panniers down from the bike and sat outside giving them a good scrub down. They surely needed it! Later, I rode down to the car cleaning place Joe had found and they got stuck in with their steam cleaner and foamy soap. I particularly wanted all the grease and chain oil removed and I was very pleased with the job they did. It wasn’t cheap but effectiveness was more important. I didn’t want to have to do the same thing again before I was allowed to ride in New Zealand. Finally I booked myself a tourist trip for Friday out to the DMZ. More on that later. I had to be at my rendezvous point by 09.30 on Thursday so I allowed an hour for the 35kms journey, not knowing how bad the Seoul rush hour would be. I needn’t have worried as it didn’t take long in the end. On the way there I was both amazed and amused by the antics of some of the riders of small bikes. They treat Seoul streets the same way that some cyclists treat those in London. They avoided jams by riding along the pavement, jumped red lights and I even saw one cross a junction by riding across the pedestrian crossing – while the pedestrians were using it! Nice and anarchic. I liked it! One of them was a scooter with home fitted outrigger wheels at the back, the rider not bothering with a crash helmet either, in common with many others. I suppose if you’re not actually on the road then it’s not needed. Stripped down ready for crating. Unlike the government, the parking attendant at the hotel was nice and helpful and directed me to a parking space on the forecourt. Right on time, the guy from the crating company turned up and I followed him to their premises. He directed me to a quiet corner where I could put into effect my size reduction plan. Off came the screen to reduce the height. Out came the front wheel and off came the front mudguard to reduce the length, with the added effect of reducing the height still further. I disconnected the clutch cable then removed the handlebars and turned them through 90 degrees. They measured Doris up and made a base to match her new length and width then they strapped her down to it with very heavy duty packing tape. 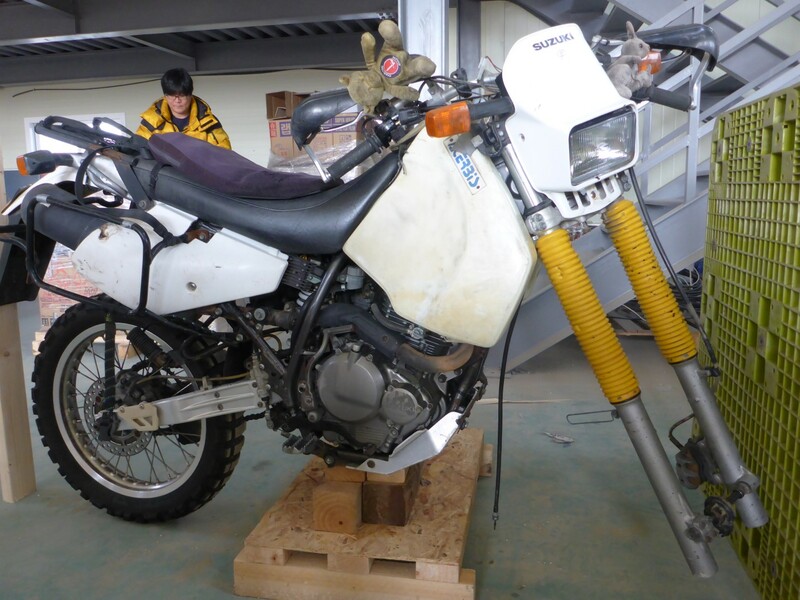 Finally we packed all the parts, panniers, bags and riding gear in around her and they wrapped her up in cling film. And that, as they say, was that! They would build the sides and top of the crate onto the base later on but my work was done. One of the guys gave me a lift to the nearest station and I headed back into town, with very mixed feelings. Yes, I trusted Wendy and the guys at the crating company, they clearly knew what they were doing. But it was the first time in nearly eight months my best friend and faithful companion and I had been apart. She looks like one of those Transformer toys. Just needs the sides and the top now. Wendy came round again at 19.30 and we went to a different restaurant. My treat this time and to prove it I even remembered my wallet! This place was similar to the one where Hiroshi worked. Each table had a barbecue in the middle of it and we were served marinated pork strips which we cooked on the grill. We were supplied with large scissors for cutting the meat into edible chunks as it cooked. The meal came with soup, rice, vegetables and some sauce. It tasted delicious but was a bit spicy. Wendy was laughing at my red and sweaty face. We were given steel chopsticks, common in Korea apparently and much easier to use than the plastic ones supplied at cheap eateries. About every fifteen minutes someone would come round and change the griddle because the cooking tended to leave plenty of carbon on there. Another really nice touch was that we were given bags in which to put our coats to protect hem from the smell of smoke. Afterwards we moved on to a coffee shop for coffee and cake. And, rare for Korea, I was able to get milk to go with my Americano. Wendy said she was very impressed with how small I’d managed to get my bike. The smallest she’d ever known, in fact. For her part she said the crate weighed in at 281kgs but she’d declared it as being 300kgs. The reason? Because then the rate goes down from $9.40 to $8.20 per Kg. Sharp thinking on her part. We’d make a great team. The final price was £1880. It sounds a lot but I’d been expecting far more so was very pleased. Before I left home I’d mentally prepared myself for this kind of expense. It’s unavoidable and all I could do was minimise it. Job done! Barbecue your meal at the table. Great Idea. Wendy and I chatted for a while. She’s forty years old and lives with her parents. Quite normal for single people in Korea it seems. She’s clearly good at her job and I suppose must be very dedicated to it. For my part I was grateful to her for her efficiency and hospitality. She’d earned a good reputation amongst other travellers and it was well deserved. I was curious why she was called Wendy and it seems that most Koreans who deal with Western companies will adopt a Western name for that purpose. She did tell what her proper name was but I have to confess I can’t remember it. So now I was just another tourist rather than a motorcycle traveller. I was due to fly out on Saturday so for Friday I had booked a trip to the DMZ. 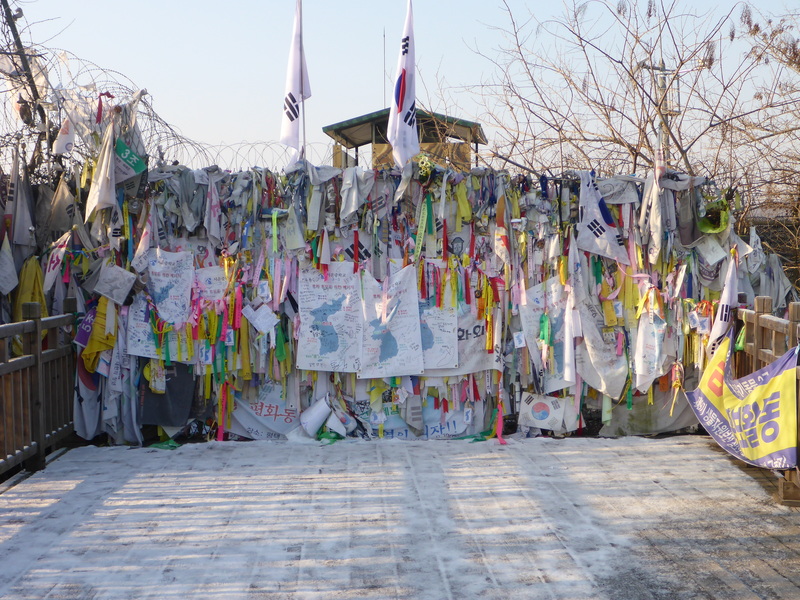 The border with North Korea is about 50kms north of Seoul – too close for comfort in many ways. 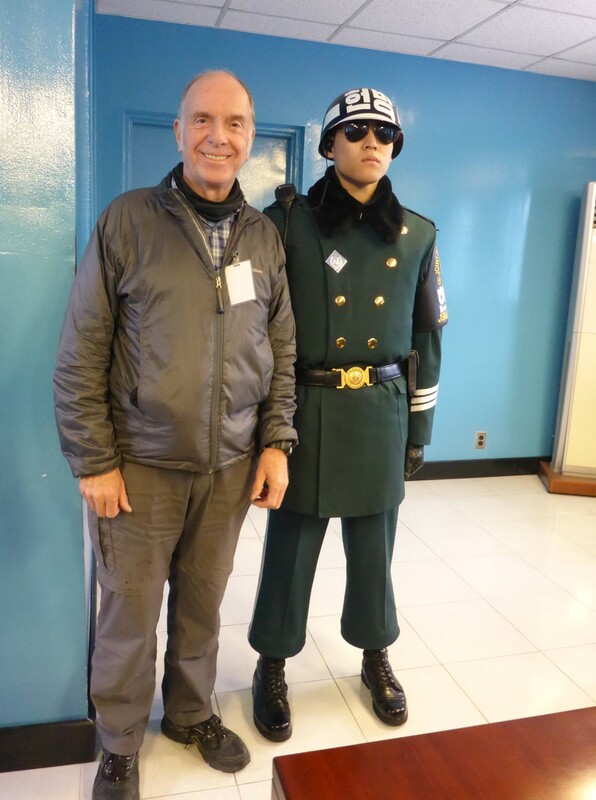 Usefully though, it meant a day trip to the DMZ was easy and not too expensive at around £80. That included an additional trip to the JSA and lunch too. The Peace Bell up at the Dpra Observator. So what are all these initials about? Here’s the brief story. 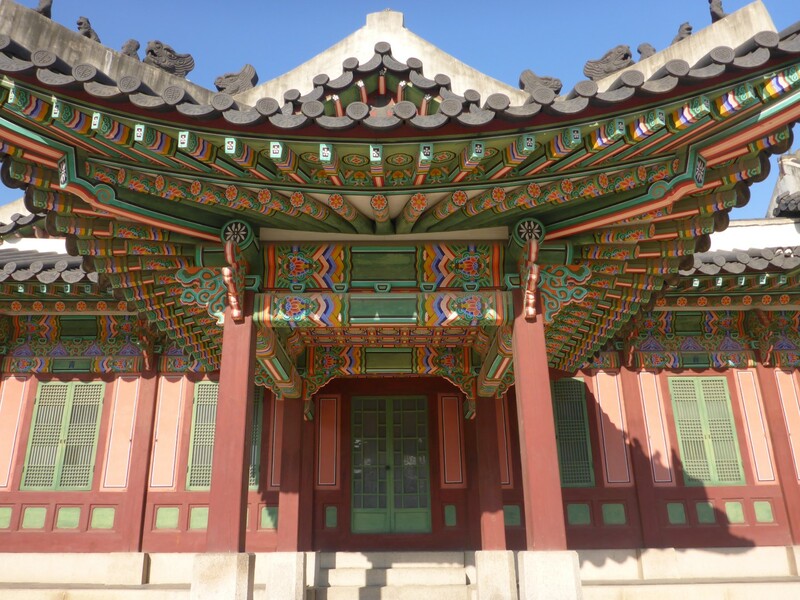 Over the centuries Korea had been under various influences, sometimes independent, other times heavily involved with the Chinese, Japanese or Russians. In the late 19th C China was pushed out, as was Russia after its defeat by Japan 1n 1904. In 1905 the Protectorate Treaty was signed and the peninsular became a protectorate of Japan. In 1910 Japan annexed Korea by means of an illegal treaty backed by force. That remained the case until the end of WW2. At that point Korea was divided in two at the 38th Parallel, with Russia controlling the north and The Allies, mainly the USA, the south. Fruitless attempts were made to create a national government and in 1948 two states were created, The People’s Republic of Korea (North) and The Republic of Korea (South). Sadly, the beginning of the Cold War prevented the creation of a unified country. The bridge across the border. The North Korean government was never happy with the division and so invaded the south in 1950. South Korea had more or less demilitarised, and most American forces had left by then, so the Communists swept through the South, occupying almost all of the country. American led UN forces then joined the fight and over time the situation was almost reversed. Until, that is, the Communist Chinese joined in. 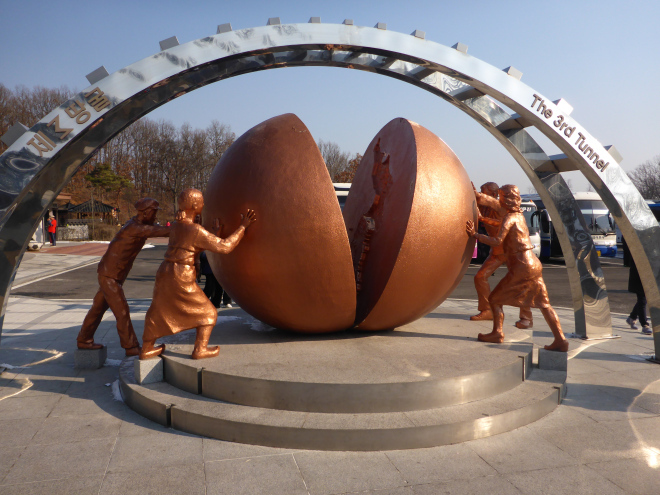 In 1953 a ceasefire was agreed and the border between the two countries was once more set along the 38th Parallel. And that’s where things now stand. Officially the two countries are at war having never signed a peace agreement. 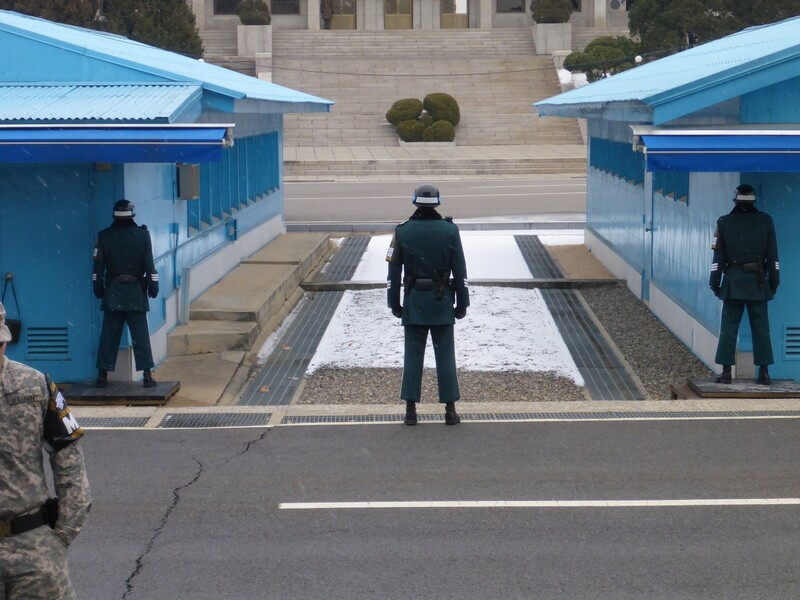 Therefore the United Nations polices the south of the area known as the Demilitarised Zone (DMZ), which extends two kilometres each side of the border, and the North Koreans police the northern side. I don’t know how many people died in that war but I couldn’t help but think what a particular waste of life it was considering nothing was achieved by either side. Today’s situation is well known, with hardline governments holding sway in both countries. There is now very little cooperation between North and South apart from in one way, which I’ll mention in a moment. The North, over the years, has constantly made threats against the South and still does. I had a few conversations with some South Koreans and asked them if they felt threatened by the attitude of the North. The answer was that although some did and some didn’t, the threat of invasion wasn’t something that affected their daily lives very much. So the scene was set and I was collected from my hostel at 07.15 and taken to the coach nearby. After several other stops to collect passengers we headed north. We had been told to bring our passports with us and we had to show these at a checkpoint as we entered the DMZ. Once inside the zone we were taken to various places. Some were memorial sites others were places from where we could look across the DMZ into North Korea. In no particular order, here’s some of them. Pleas for peace from South Koreans. Tongilchon (Unification Village) is located within the southern part of the DMZ. The residents here, as a reward for living, literally, under the North Korean flag, pay no tax and avoid military service, which is one year for all other South Koreans. The land is allocated to the residents by the government and the 162 families there apparently make a very good living as the land is very produvtive. North Korea also built a village in their part of the DMZ but it is a ghost village with nobody living in it. However they keep up the pretence by having lights that turn on and off automatically.in the houses. The South Koreans erected a 100 metre tall flagpole so the North erected one that is 160 metres tall and carries a flag that is so big it weighs 250kgs. 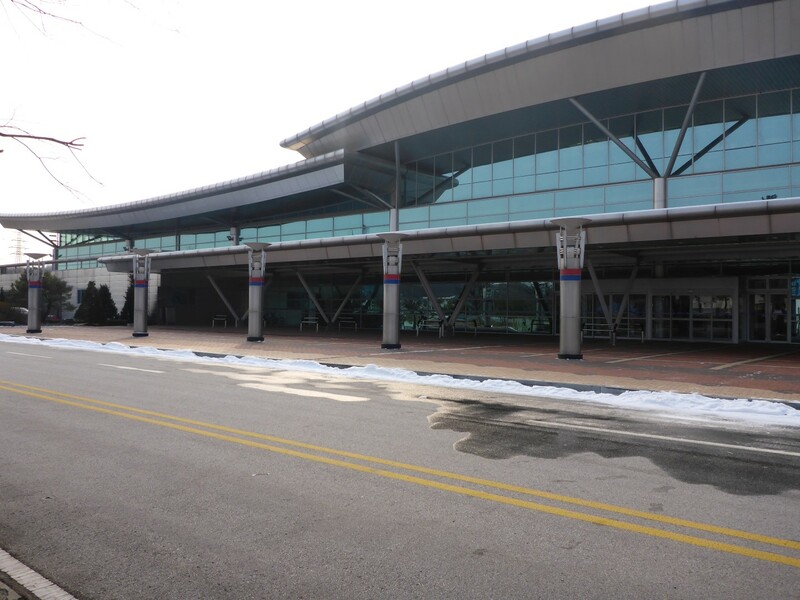 Dorasan Station. Waiting for the first train from the north. Dorasan station is the last one on the line running north from Seoul and since the recent freezing of relations trains go no further. 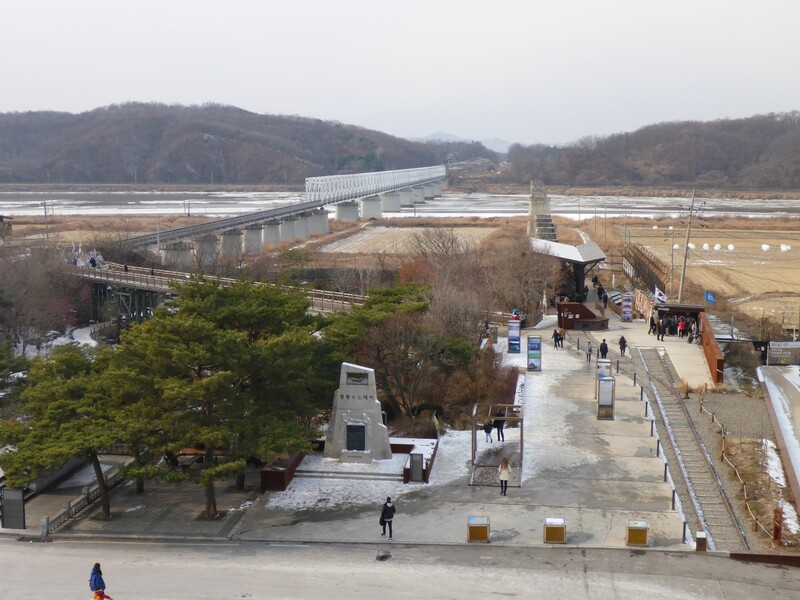 It is a tourist spot and you can get a pretend North Korean passport stamp there. This bright, shiny station sits there waiting for the day of reunification when it is hoped trains will be able to link to the existing systems through China, Mongolia,Russia, and eventually to Europe. The hoped for trans Asia railway. We were taken down into Tunnel Number Three for a look into what I thought was one of the weirdest places we visited. It seems that North Korea are constantly digging tunnels under the DMZ to gain access for spies and with a view to invading the South. Four have been found so far and there may well be more. They’re not sure. The rather alarming thing about this one was that it’s big enough to allow 30,000 soldiers per hour to pass through it, along with small artillery pieces. Remember Seoul is only 50kms away and that’s one of the reasons why I wanted to know if South Koreans are worried about being invaded. I mentioned the one remaining area of cooperation between North and South. This is Kaesong Industrial Region. It is operated as a collaborative economic development between the two countries and is located 10kms north of the DMZ. 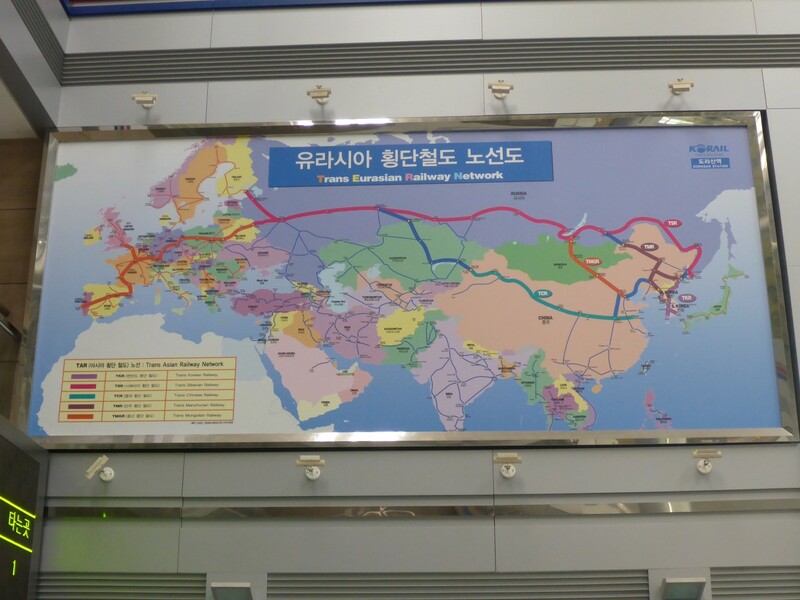 There is direct road and rail access to South Korea. It allows South Korean companies to employ cheap labour that is educated, skilled and fluent in Korean whilst providing the North with a valuable source of foreign currency. 53,000 North Koreans work for 123 South Korean companies and their $90 million wages are paid direct to the North Korean government. 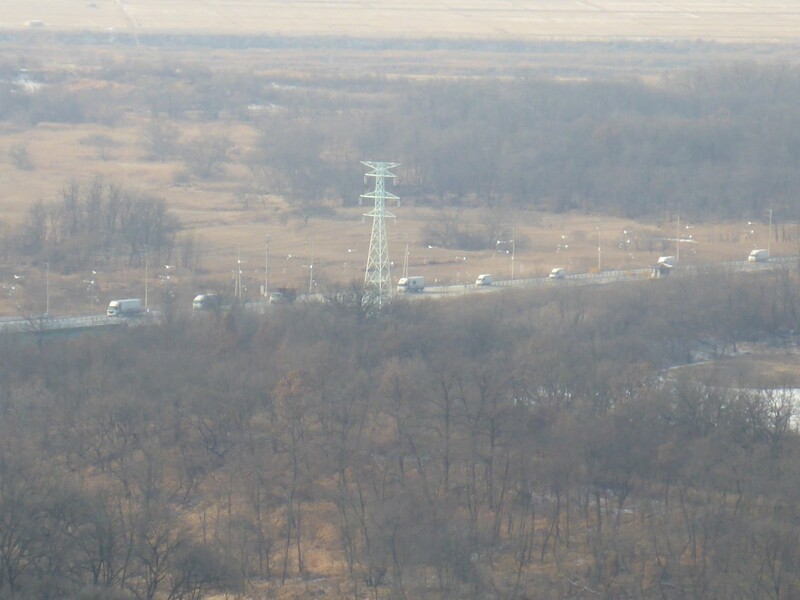 Although there have been occasional problems with access when relations have been rocky, and it was closed for a short period, it still works and we were able to see a long line of trucks and vans travelling from North to South across the Freedom Bridge. Trucks cross the Freedom Bridge. We were shown a film describing how the current situation came about. At one time there was hope that with Perstroika in Russia and the collapse of communism in Europe, the North and the South might enjoy some kind of reunification but it was never on the cards as far as the North was concerned. It might be tempting to see the North/South Korean situation in the same light as the East/West German one but there are many differences. Although the split evolved in a similar way after WW2 the fact that there was a war between them, and the passage of sixty years since the division, rather than twenty seven in the case of Germany, precludes any easy solution. But we can only hope. Because I had also booked a trip to the Joint Security Area (JSA) at Panmunjom I was taken to a restaurant where I enjoyed a very nice Beef and Rice lunch. I enjoyed a conversation with a Japanese Kiwi too. Then we boarded another coach and were taken a little further to a very much stricter checkpoint. Here we had to show our passports and sign a form declaring that we’d be good boys and girls and obey all the rules. We were also agreeing that we understood we were entering a hostile area under military control and our safety could not be guaranteed. Blimey! On the assumption that there might be personnel from the North there too, we agreed not to point, make gestures or scoff in such a way that the North could use them as propaganda against the South. We were also forbidden to cross the line that divided South from North. Serious stuff! The table where North and South meet. The JSA, also known as the Truce Village, is the area where all meetings between the North and South take place. 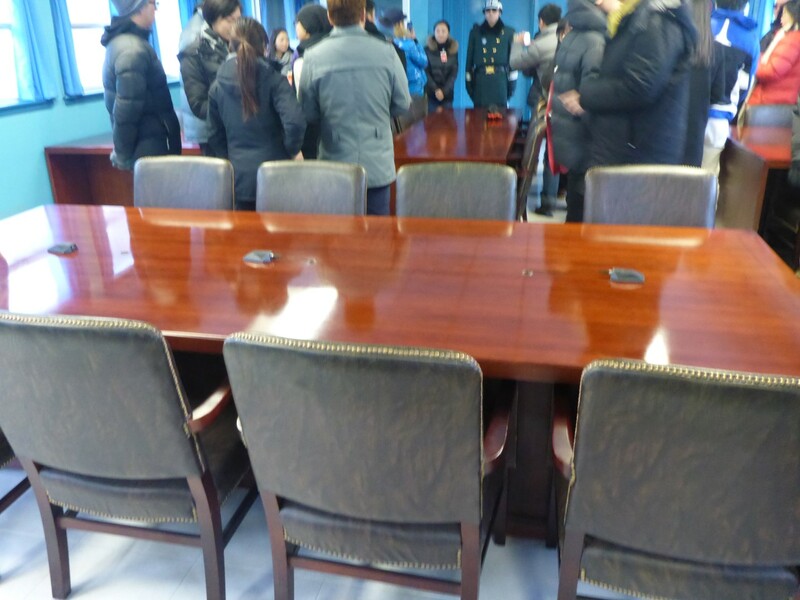 There are a series of buildings, the main one of which has a conference table in it, straddling the line of the border, and this was where we were allowed to go. Because there were no North Korean personnel around we were allowed to cross over the ‘border’ and I walked two metres into the North. An ordinary action in a very extraordinary place and a strange feeling after all the security build up. The military personnel were a mixture of Americans and South Koreans, all under the auspices of the United Nations. The Yanks were dressed in fatigues and looked relaxed. The Koreans were wearing very smart uniforms and stood stiffly in a modified Tae Kwon Do stance with solid facial expressions, clenched fists, and sunglasses. This is meant to intimidate the North Koreans. To join this unit they must be at least 17 cms tall, and have a black belt in Tae Kwon Do or Judo. I am officially in North Korea at this point. The guard doesn’t seem impressed. We were allowed a certain period of time inside the building and then another limited time for taking photos from the outside. If anyone stepped over the lines which marked the edge of the tourist area they were very sharply told to move back. Ask me how I know. On the way back we were shown the spot were two American soldiers were killed by North Korean troops while they were out cutting the branches off a tree. Up to that point the two sides had mixed freely within the DMZ but after that incident the Military Demarcation Line (MDL) was introduced and that is why there is a white line painted across the centre of the hut we were in, along with concrete slabs between the buildings. Cross at your peril! Tae Kwon Do stance, ever alert. 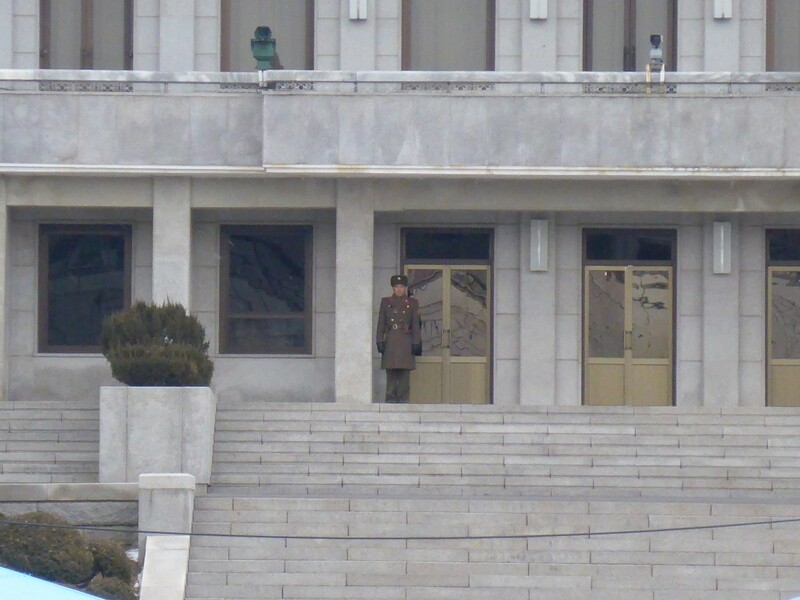 Although the North Korean guard doesn’t look too worried. To someone like me who is interested in history, politics and current affairs, this day out ticked all the boxes. Albeit tinged with sadness about the situation between the two countries, it had been a great way to spend my last day in Korea.